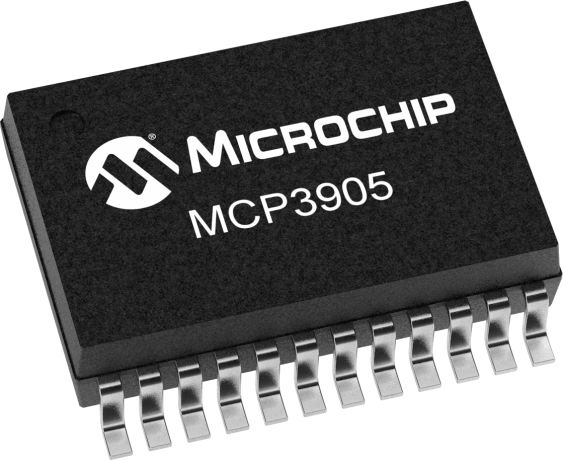 The MCP3905 is an energy measurement IC supporting the IEC 62053 international energy metering specification. The output of the device includes a frequency proportional to the average active (real) power at the inputs as well as a higher frequency output proportional to the instantaneous power for meter calibration. The MCP3905 incorporates two 16-bit delta-sigma ADCs with a progammable gain up to 16, which enable small shunt meter designs for measuring a wide range of Ib and Imax currents. The integrated on-chip voltage reference has ultra-low temperature drift of 15 ppm per degree C. Also on-chip is a fixed-function DSP for active (real) power calculation. For mechanical counter power meter designs, the MCP3905 has a strong 15 mA drive current to reduce field failures and mechanical counter sticking.